JTG polymer Spartan Helmet with crossed swords patch in black with white logo and grey edge, measuring 5.5cm in diameter. 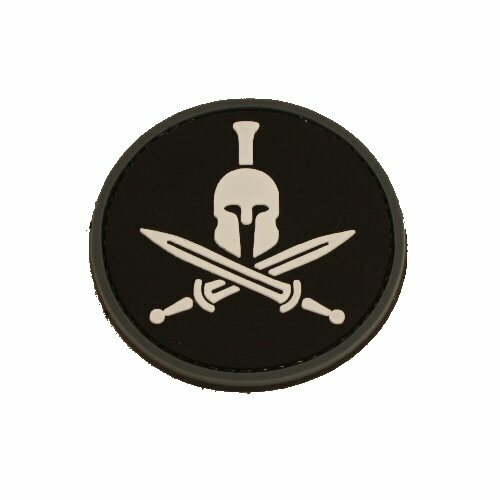 This size can fit onto a tactical cap, or onto the front of a gun bag or arm insignia panel. The logo only shows the helmet with crossed swords and no writing. Hooked side velcro backing is sewn on all around sides for durability. Polymer patch is more durable than embroidered or woven patch and offers some resistance to abrasion. Price is for ONE patch only. Can be combined with Spartan Molon Labe t-shirt or worn on its own.